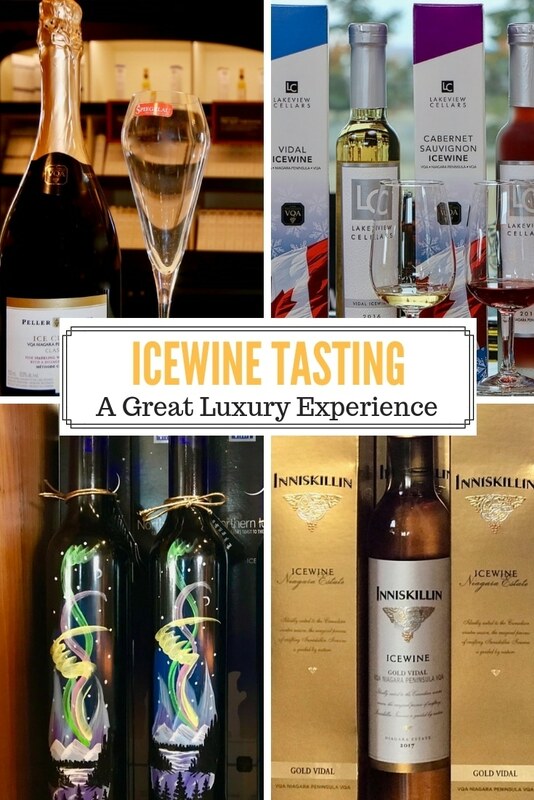 It was a great treat to do icewine tasting in Niagara when we travelled to Niagara Falls as an early birthday celebration! Since we live in Toronto, it is easy for us to visit Niagara Falls over and over again. But it was always good when we had a special reason to visit. We toured the wineries in Niagara-On-The-Lake (NOTL) on the way to and from our stay in Niagara Falls. Our great suite for two days looked out over Niagara Falls. And we got the best views during the day, at sunset and for the night light show. 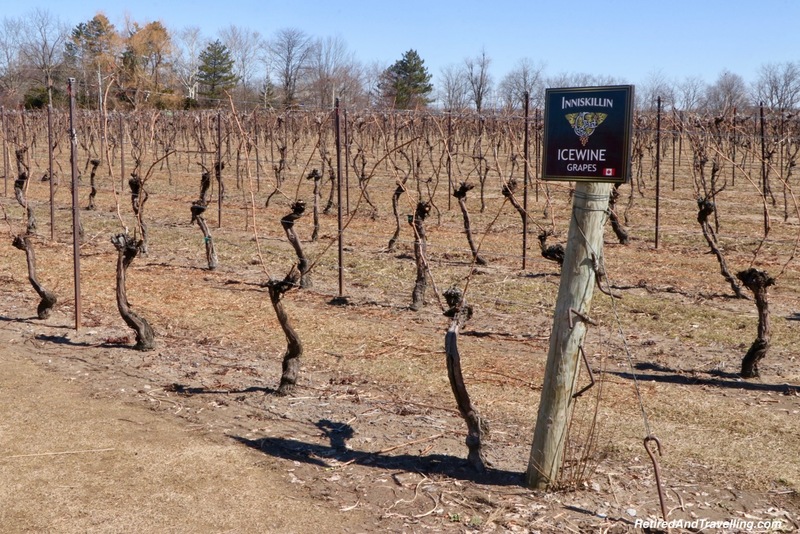 We knew a little about icewine before we headed off for our icewine tasting in Niagara. Late season harvested grapes like Vidal and Cabernet Sauvignon are typically used for icewines. 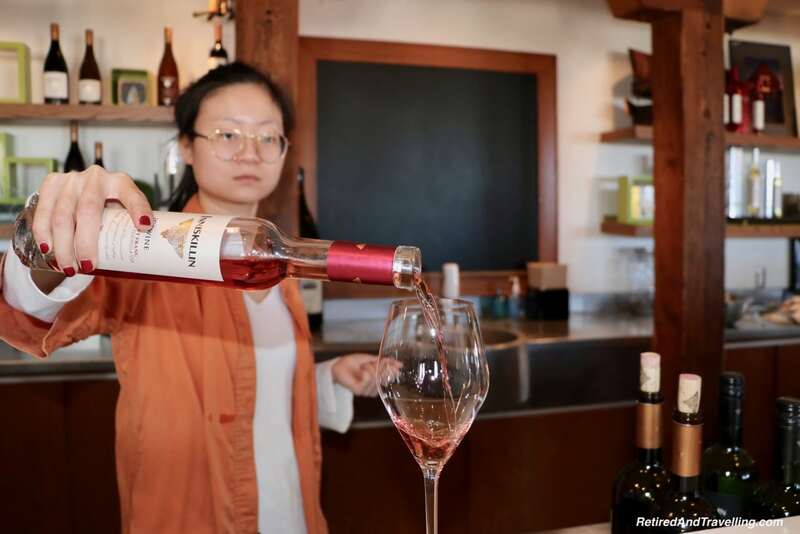 Although Riesling, Gewerztraminer and Cabernet Franc are now also being used in the Niagara region. After the leaves fall off the vines, nets are put around the grapes to keep the birds away. As the temperature falls, the grapes freeze. This concentrates the sugars and the flavour intensifies. When the exact right temperature conditions are hit (about -8℃ or 20℉), the grapes are hand picked or shaken from the vines. The grapes are then pressed when they are still cold. It takes a lot of grapes to produce icewine. And thus typically icewines are more expensive that traditional wines made with the same grapes. 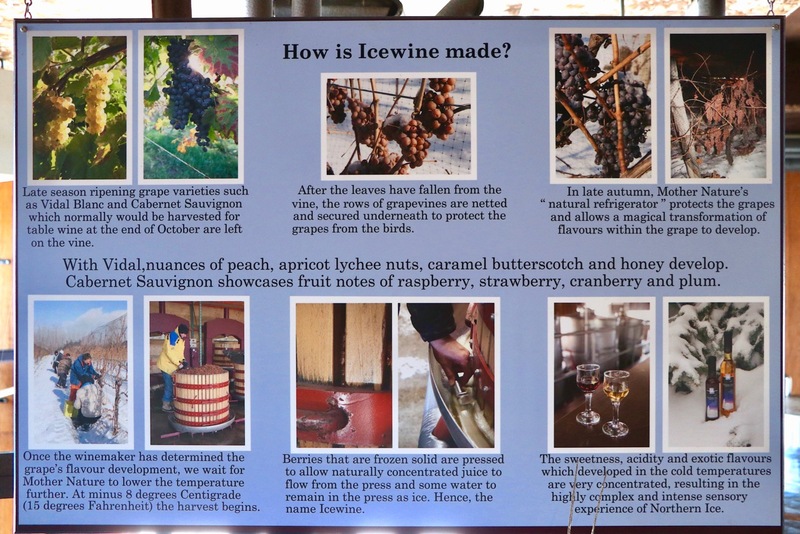 We were certainly excited to learn more when we went icewine tasting in Niagara. Before we left home, we plotted our winery tour route. Normally we would not drive and do wine tasting. But we planned to break our stops in two. We did half on our way to stay in Niagara Falls to see the colours. And the other half on our way back. David loves his wines sweet and was certain he would love the icewines. I am less of a fan. So we knew we would only ever share one tasting card. So driving worked just fine. Our first stop was at Lakeview Cellars (aka Diamond Estates). 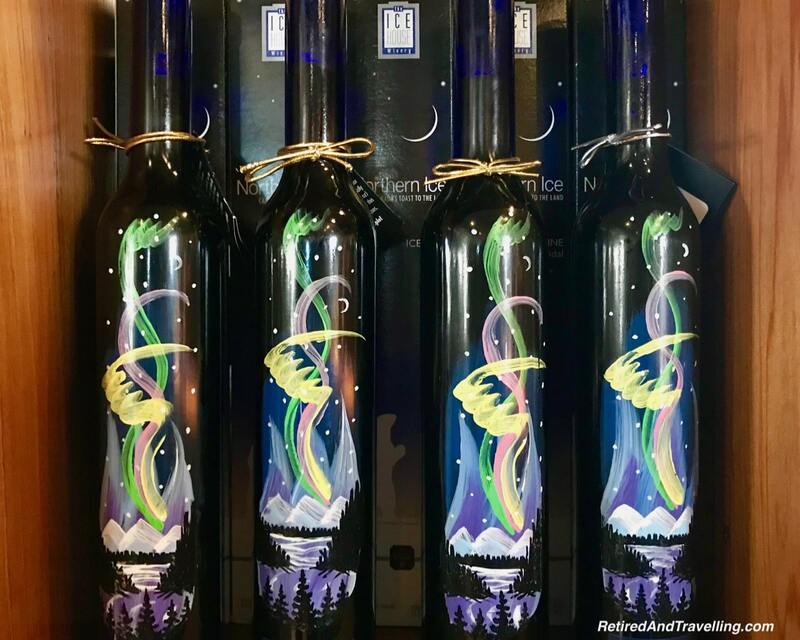 They won the best dessert wine of the year in 2016 with their Vidal icewine. That would be our first taste test. We entered the store and wandered around. There was an interesting collection of wines and accessories. I loved the beautiful Group of Seven art labels on the McMichael collection. 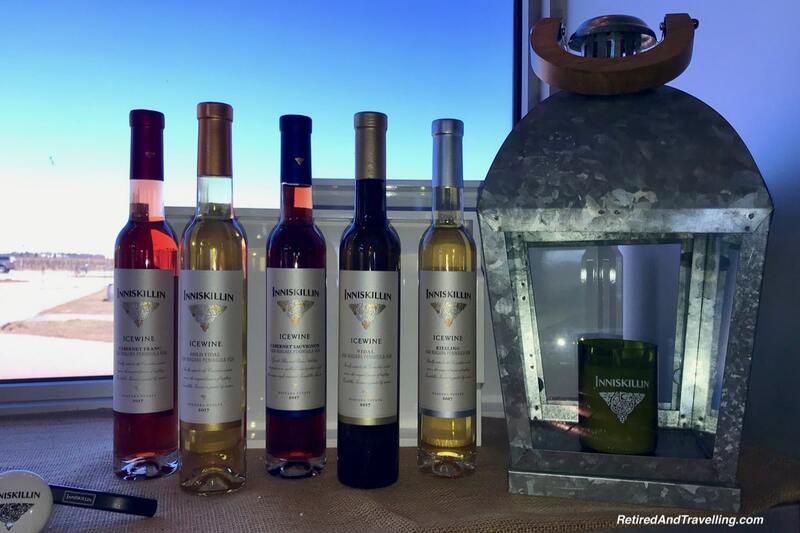 There were 5 different varietals of icewine available: Vidal, Riesling, Gewerztraminer, Cabernet Sauvignon and Cabernet Franc. We learned that the vast majority of icewine in the Niagara region was made from Vidal grapes with their thinner skins. I was intrigued to find the two red icewines. We decided to try the Vidal as a baseline and sample the two reds. As I expected, I did not really like the Vidal. Although later on our tours, I finally found one Vidal that was ok. 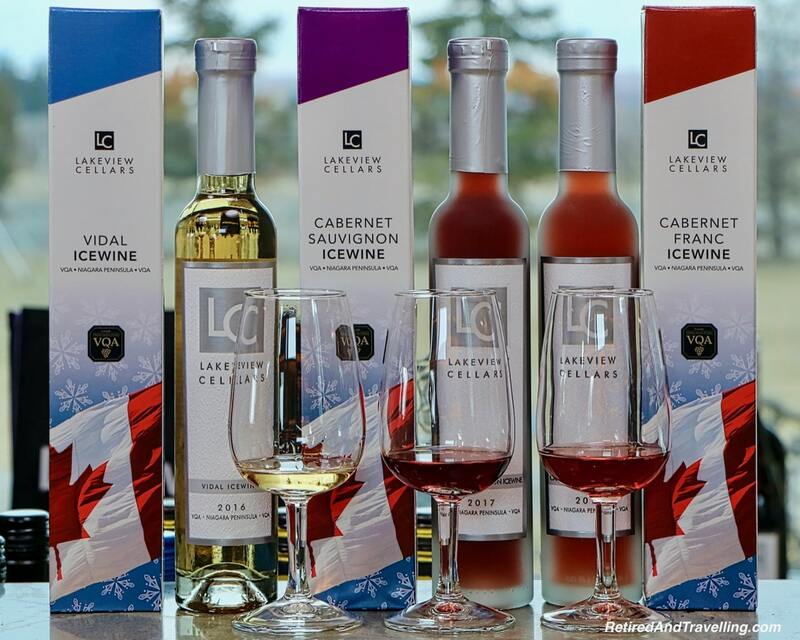 But the fruity flavour in both the Cabernet Sauvignon and Cabernet Franc icewines delighted us. The strawberry notes just jumped on my palate. 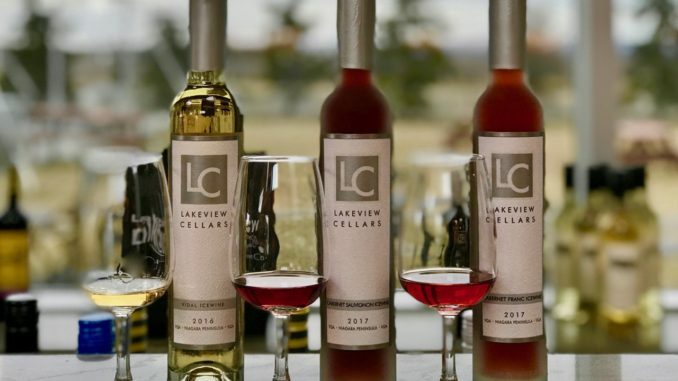 The stop at Lakeview Cellars was a great start to our icewine tasting in Niagara. David’s research had a whole page on chocolate. The notes for Pillittieri Estates read “chocolate icewine”. You know we stopped there next. 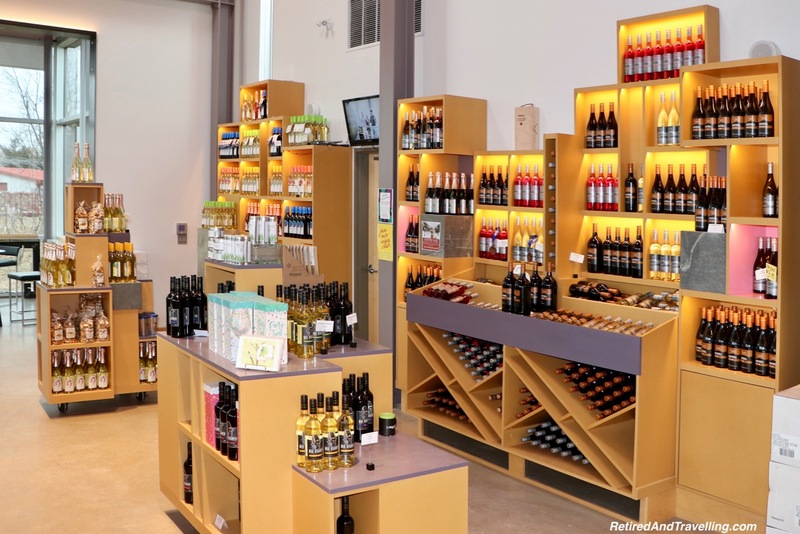 We wandered inside the shop and found lots of wine and icewine. But we found no chocolate icewine. 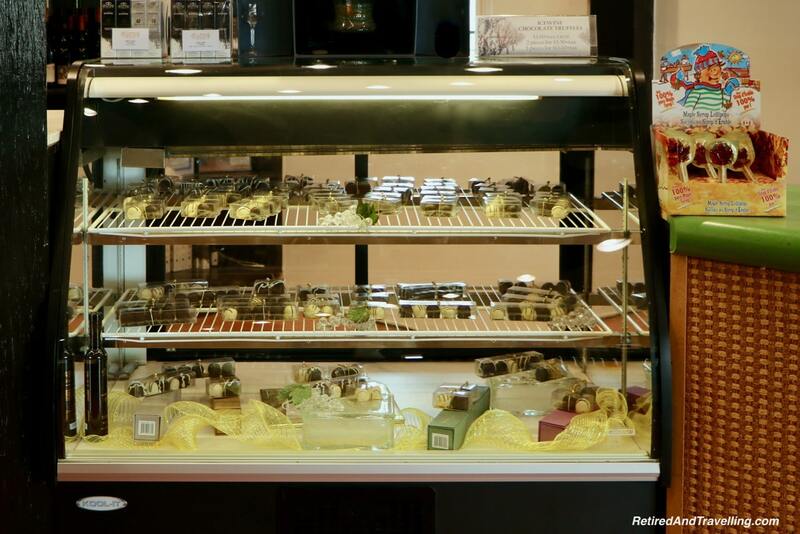 And then in the corner of the shop we found a large display case with truffles. Of course they were chocolate icewine truffles. And the mystery was solved. We bought two for a treat. 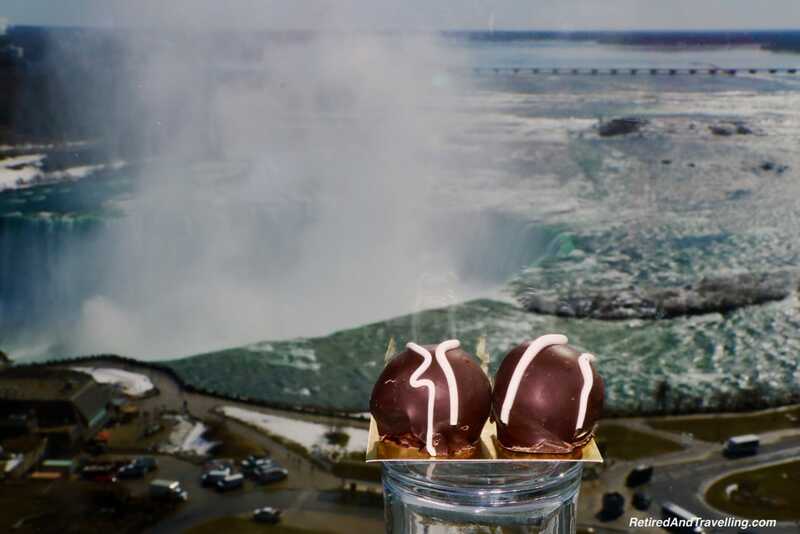 And enjoyed them with a view of Niagara Falls. 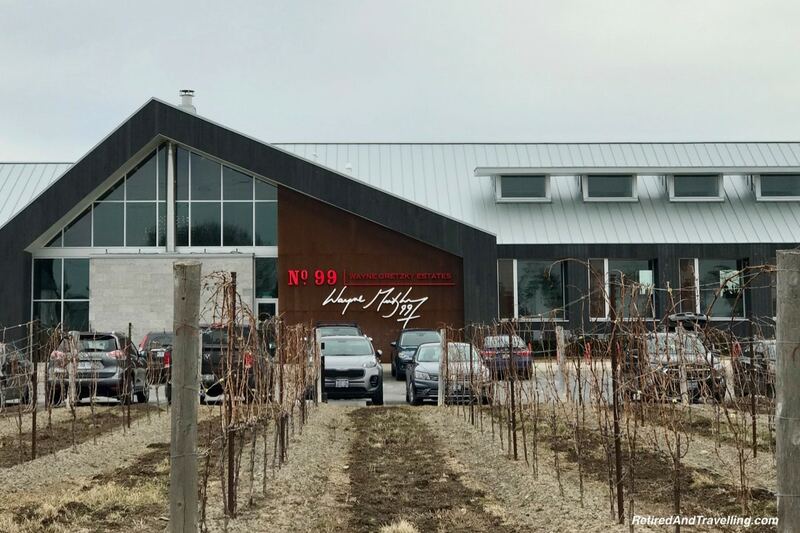 The second stop on our icewine tasting in Niagara gave us another way to sample icewine. 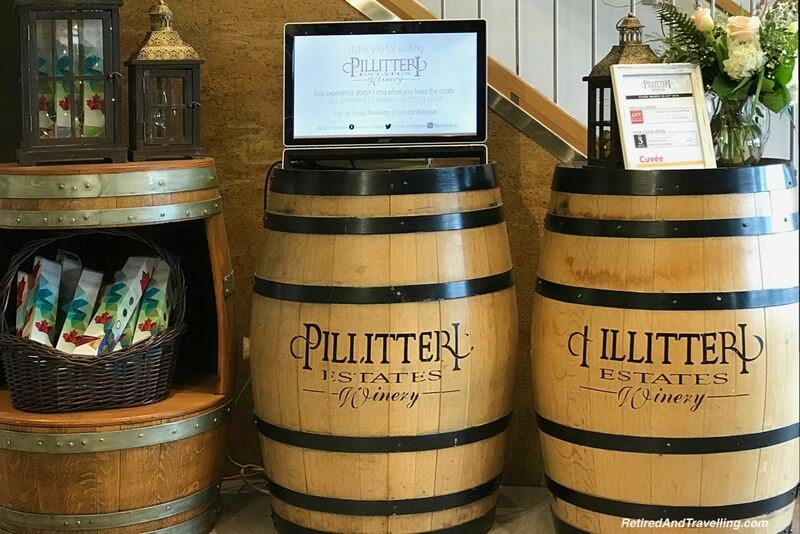 We navigated our way to Peller Estates Winery. Compared to the first two wineries, this was a much larger commercial property. We learned that Peller was part of a larger winery group that included both the Wayne Gretzky and Trius wineries. 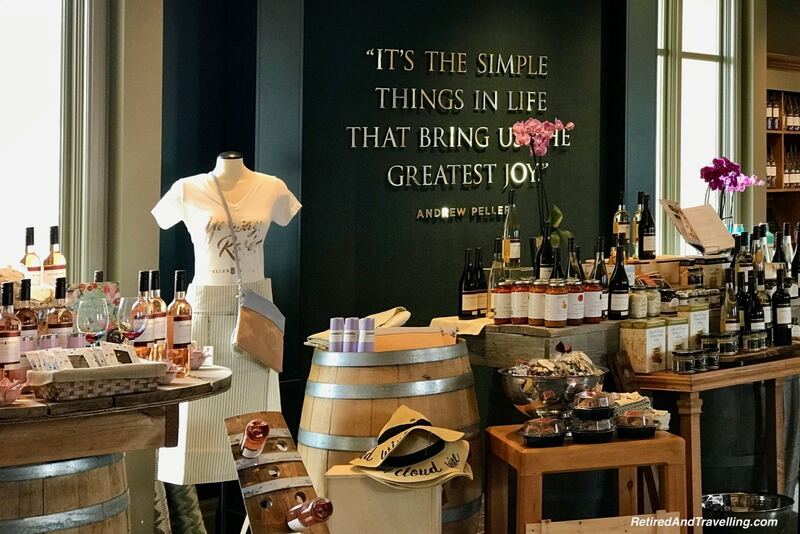 The Peller family actually started their wine career making Andres and Baby Duck in BC. When they came to Ontario, they started first in Grimsby and then moved to NOTL. They also have wineries we plan to visit in the Okanagan Valley in British Columbia later in the spring. 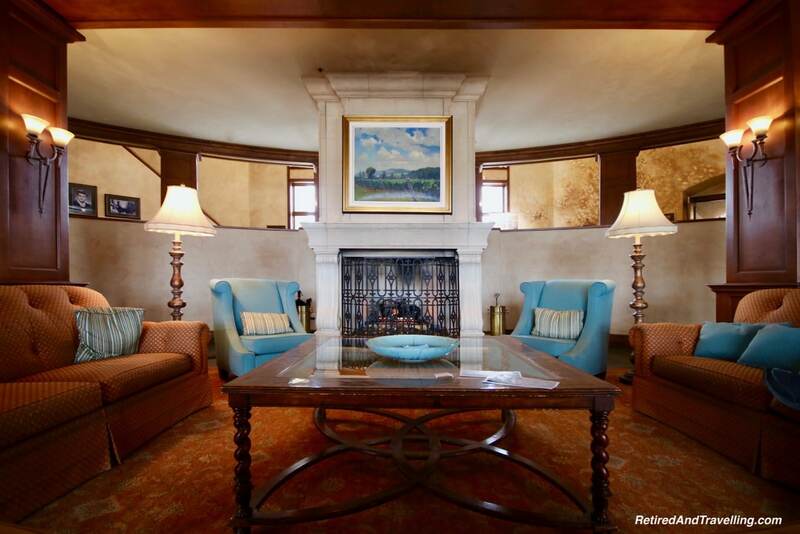 We entered the main building and were greeted with a warming view of a fireplace with cozy chairs. Off to one side was the restaurant with a great sounding menu. And on the other side was the shop and tasting room. We found a large selection of wines and icewines for sale as we wandered around. There were 4 different varietals of icewine: Vidal, Riesling, Cabernet Franc and an Oak Aged. We considered several options for tastings. But ultimately decided we needed to do the wine tasting paired with cheese and chocolate. This gave us a little different experience for icewine tasting in Niagara. We always love the chance to do wine pairings with food. 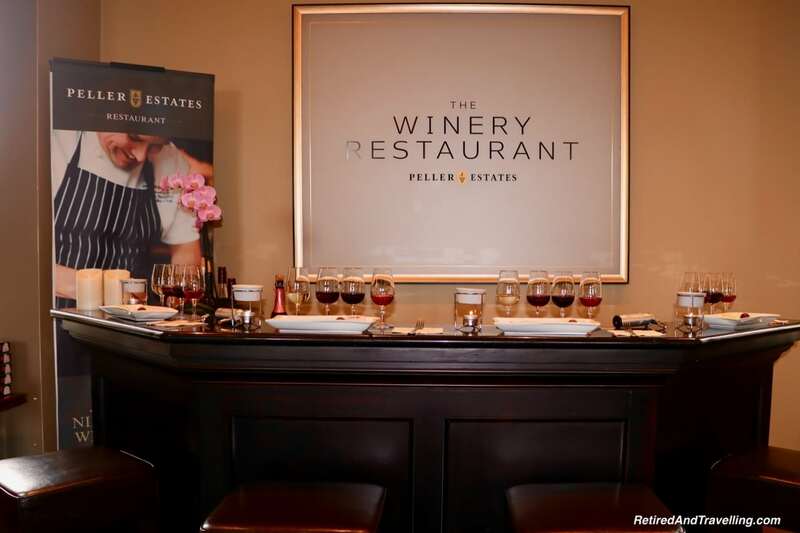 We did some great wine pairings on our recent visit to Napa. When the pairing is cheese and chocolate, we are very happy. Certainly we had a treat doing chocolate and wine pairing on our stay at the Ritz-Carlton in Geneva. The wine tasting at Peller started with a toast and a Rosé Cuvée. This sparkling wine used Gamay grape skins for colour and had icewine added during the second fermentation to make it a bit sweeter. We moved on to a dry Riesling. Paired with the Riesling was melted cheese and a green apple. The combination took down the sweetness and made it a bit more tart. We moved on to the red wines with a Gamay Noir. It was smooth at the first sip and then the tannins burst when we swallowed. Our food pairing was a tortilla chip that we toasted cheese on. It was amazing how much the wine toned down after the food pairing. The next wine was a young Cabernet Franc that had been aged for two years. The tannins exploded on the first sip. When we had a little dark chocolate and tried this wine again, it settled the wine taste right down. The final tasting was with a Cabernet Franc ice wine. It was the same grapes as the previous wine. But the grapes were picked late as icewine grapes. I already knew that I liked this icewine varietal. It was great with the dark chocolate. 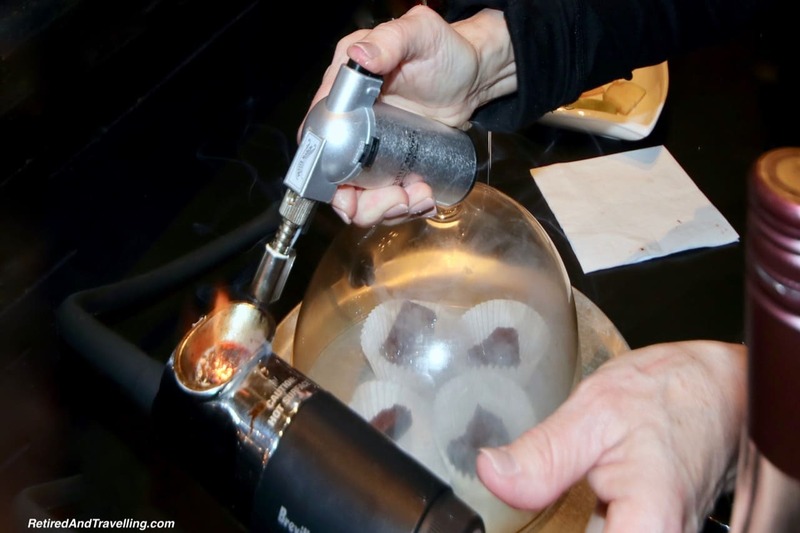 But then we watched as our demonstrator smoked brownie pieces with apple wood chips for this pairing. 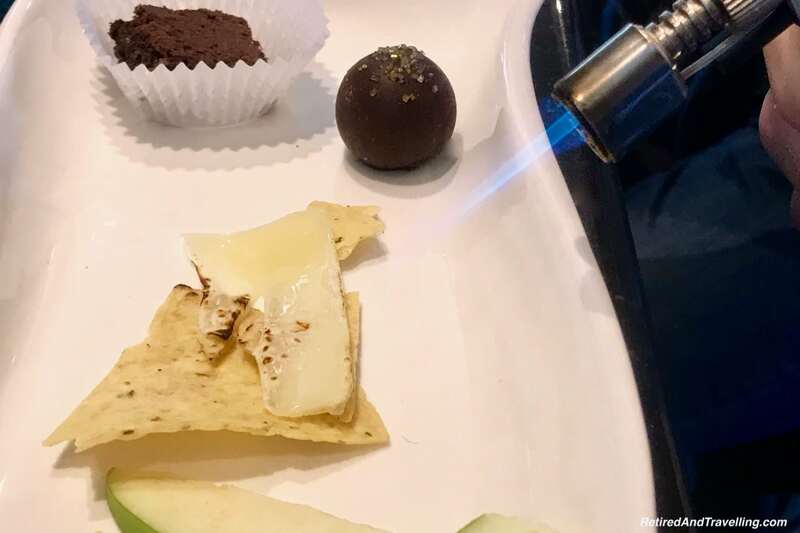 We found that the smokey chocolate made the icewine taste less sweet. We tried the different wines with different foods. The dark chocolate seemed to go with almost everything! The cheese, chocolate and wine pairing at Peller Estates Winery was a great way to finish up our first day of wine and icewine tasting in Niagara. On our way back from our visit to Niagara Falls for the colour show, our first icewine tasting in Niagara was at the Ice House Winery. I absolutely wanted to try an ice wine slushy! 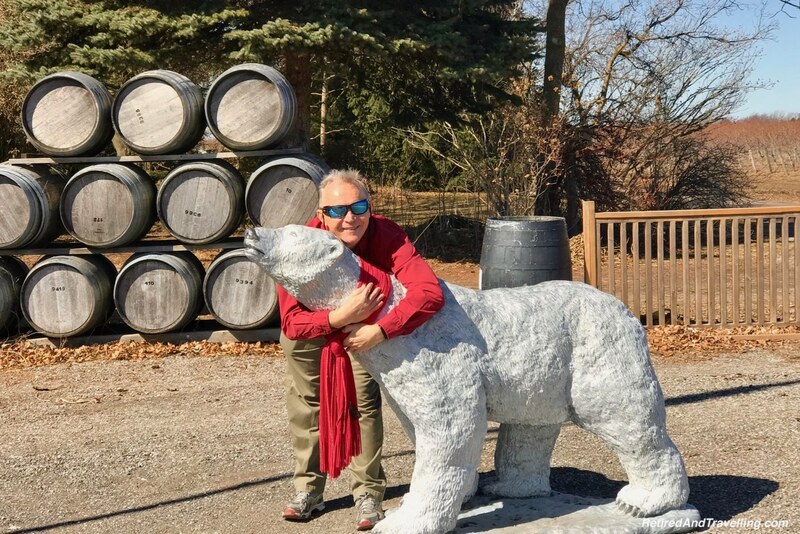 We pulled in and made sure to give Polaris the Polar Bear a hug for good luck. It was a small, cozy inside layout. 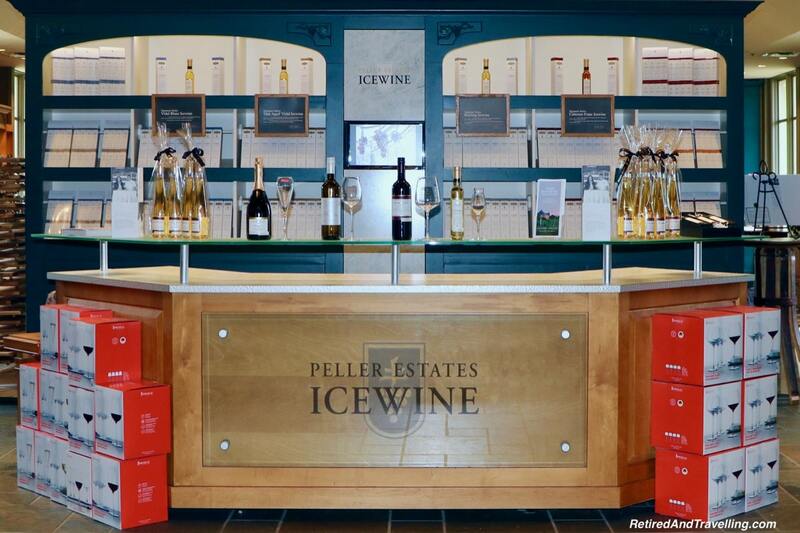 This winery only produces only icewines. But it does produce in 5 varieties: Vidal, Riesling, Gewerztraminer, Cabernet Sauvignon and Cabernet Franc. We wandered around the store. And found the greatest gift bottles, each decorated by the local artist Ron Pare. We decided not to do an icewine tasting. But we were not passing on an icewine slushy. There were two varieties offered and of course I opted to try the Cabernet over the Vidal. The slushy icewine mix was sold as a separate product if you wanted to make them at home. The slushy version of ice wine seemed to be a little less sweet. But that might be the effect from being so cold. I am sure they would be very refreshing in the middle of the summer. 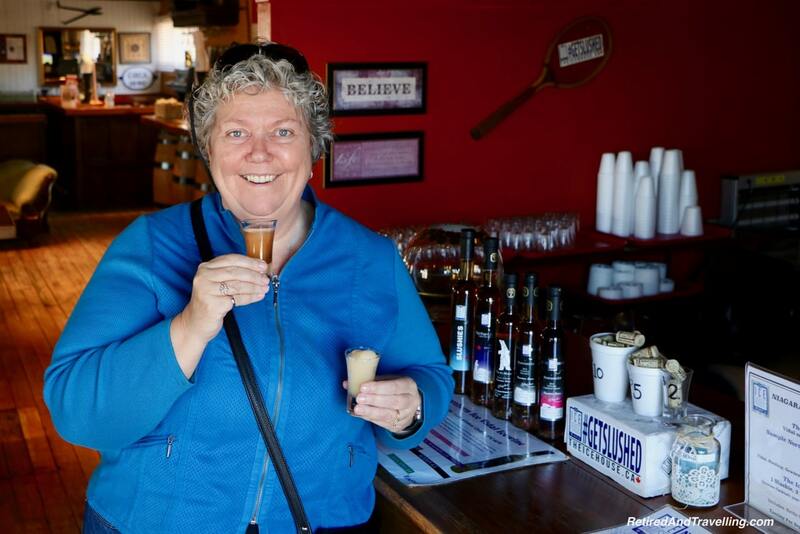 We were glad we stopped at the Ice House Winery on our icewine tasting in Niagara to try a frozen treat. 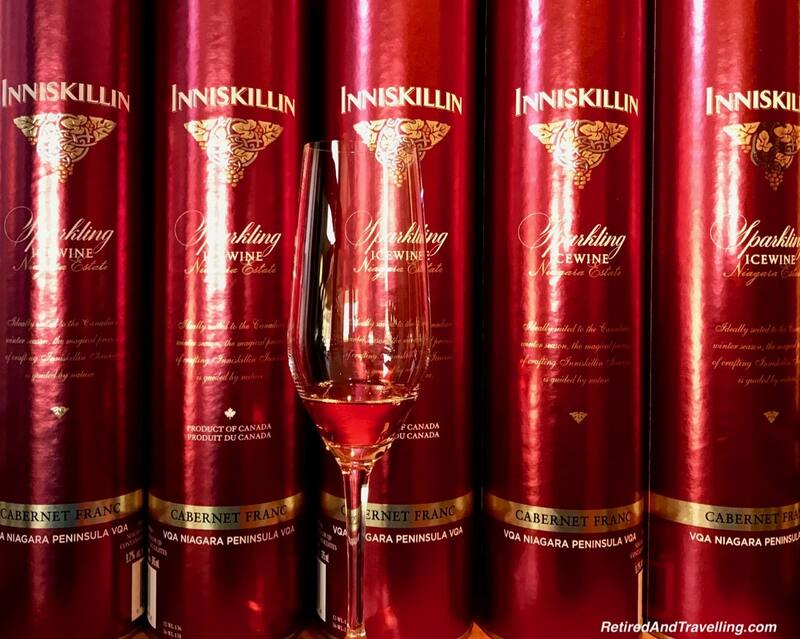 If you think about icewine in Niagara, most people will think about the Inniskillin Niagara Estate. So we could not leave without a stop at this winery. 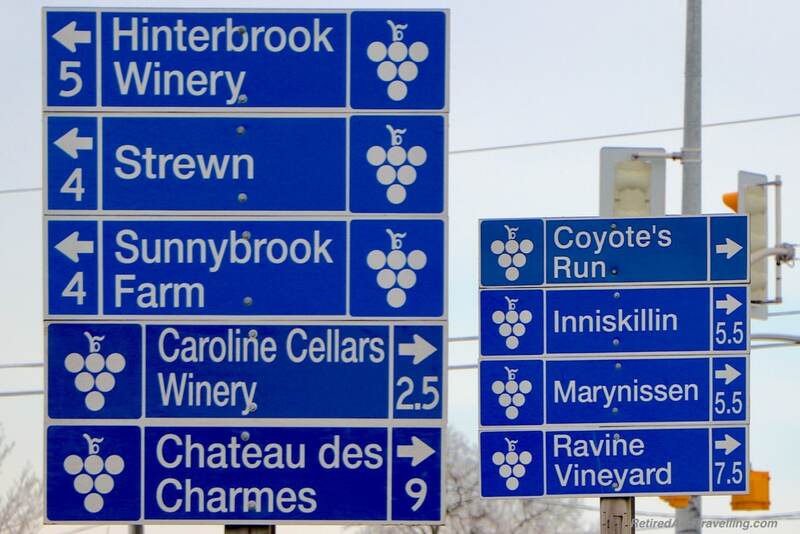 Inniskillin produces a wide variety of white and red wines. They have icewines in Vidal, Riesling, Cabernet Sauvignon, Cabernet Franc and a special Gold Label Vidal. Many of the sparking icewines are only called that because there is a small amount of icewine added to sweeten the sparkling wine. 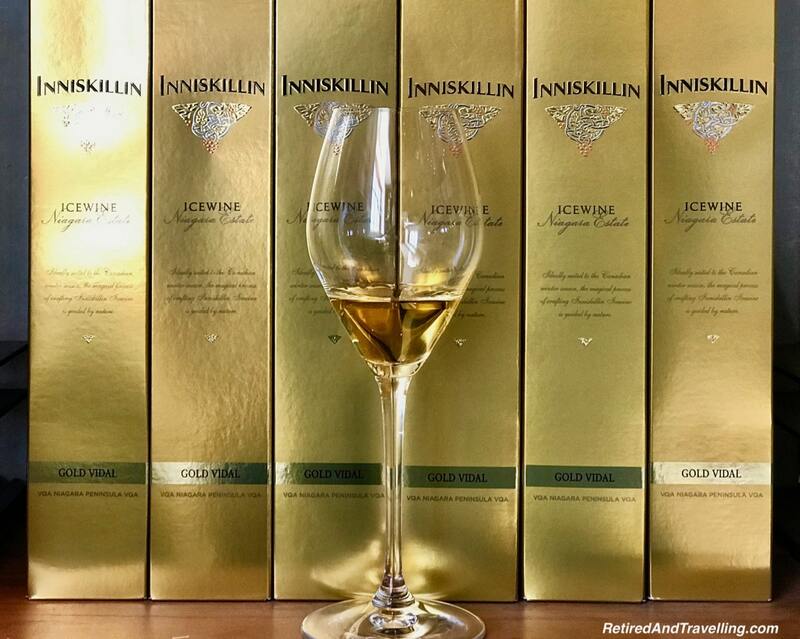 But at Inniskillen, the ice wine grapes are used to make the sparkling wine using the charmat or cuve close method. Fermentation is done in stainless steel tanks and the duration of fermentation affects the quality. A longer fermentation preserves the wine’s aromas and produces finer bubbles. On our travels, we were learning so much about the sparkling wine making process. 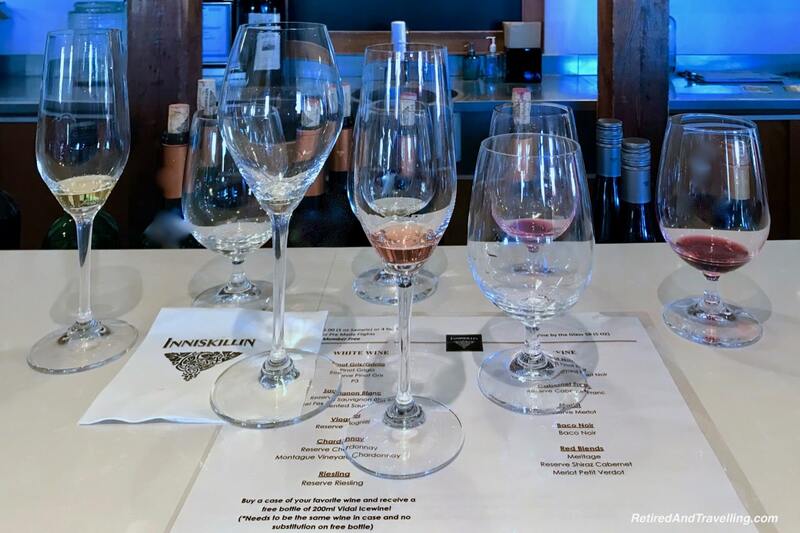 We saw the traditional French champagne method used when we went wine tasting in Temecula, California. 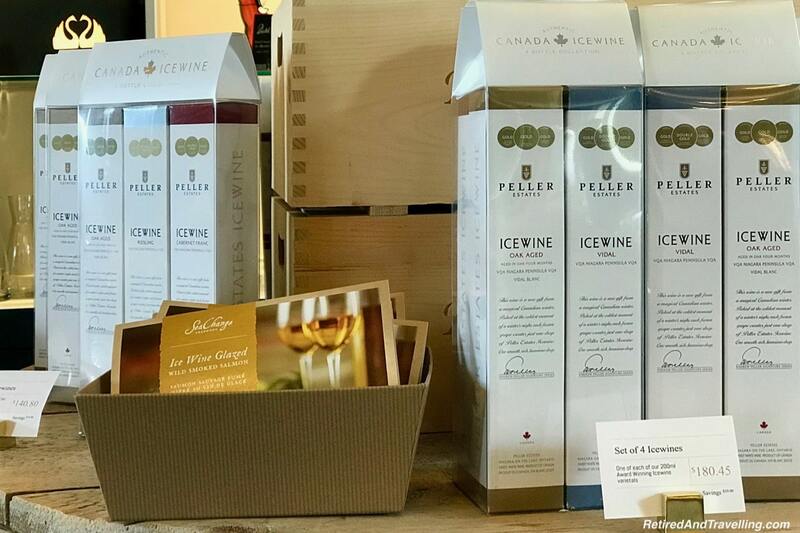 We settled in to taste our way through the wine and ice wine card on our visit for icewine tasting in Niagara. Our tasting started with white and red wines. The Riesling was too dry but the Pinot Gris was a perfect slightly sweeter white. The Meritage Shiraz blend was ok. But I was taken by surprise by the high tannins and fruity taste of the Baco Noir. I wanted to try this wine some more. So we bought a bottle to take home. We then moved to the icewines. The Cabernet Franc ice wine wowed me again with the burst of strawberry flavour. 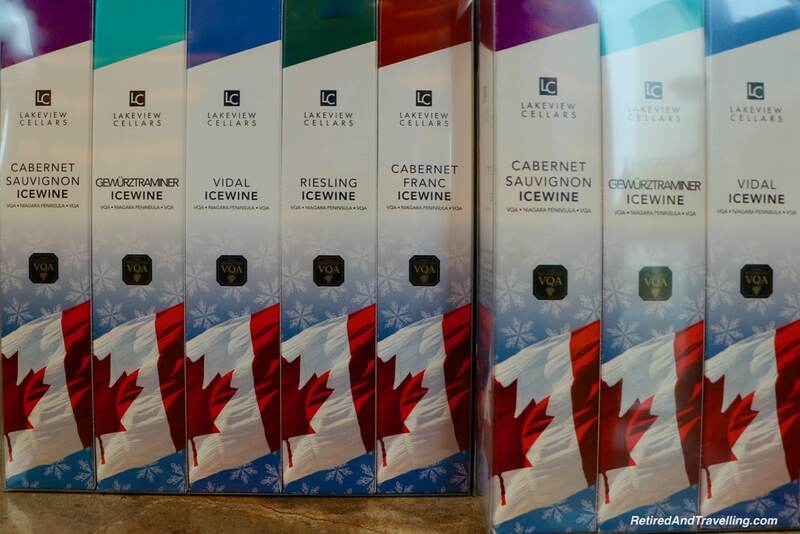 It was my favourite of all the Cabernet Franc icewines we tasted. Adding dark chocolate was perfect. So we went home with a bottle of this too. Only after I picked it up did we discover the real premium price for non-Vidal ice wines. We tried the Gold Label Vidal. It was extra syrupy sweet. And of course, David loved it. We were offered a taste of the Sparkling Vidal and Sparkling Cabernet Franc icewines too. The sparkling wines were far too sweet for me. And they did not seem to have the fine bubbles I liked in my sparkling wine. I certainly did not like these enough to pay the premium price. It was great to drink our way through a broad range of wine and ice wine tasting in Niagara at Inniskillin. 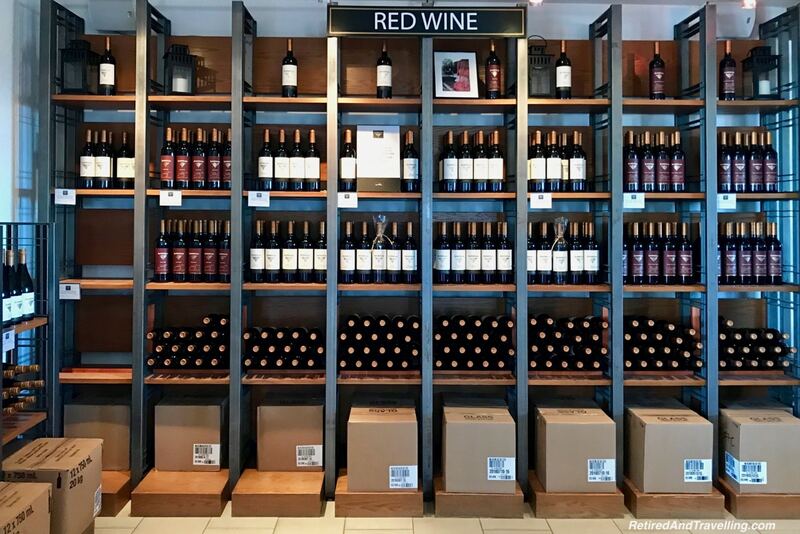 We stopped at a few more wineries to look at the vineyards and shops in Niagara. But we were done with wine tasting for this visit. A birthday is always a great excuse to plan a few days away. We started the year for David’s birthday with a splurge at the Ritz-Carlton Montreal. A short getaway to Niagara Falls to see it in colour was the perfect way to start the celebrations for my big milestone birthday. Day views of Niagara Falls were awesome. But the sight of the falls all dressed in colour were magical. It was great to return to Niagara Falls for this new experience. Of course, 16 days in Grand Cayman at the Ritz-Carlton Grand Cayman was the perfect way to extend those celebrations. 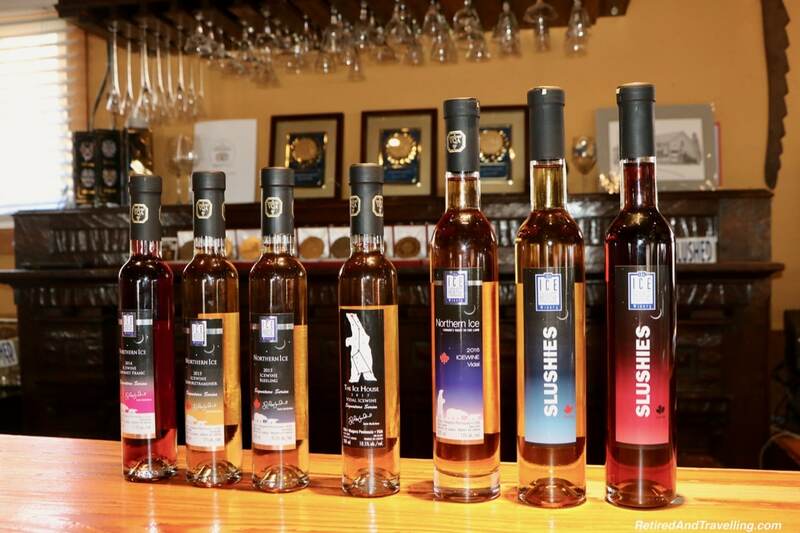 We loved the chance to sample a wide variety of ice wines on our travels around Niagara-On-The-Lake. 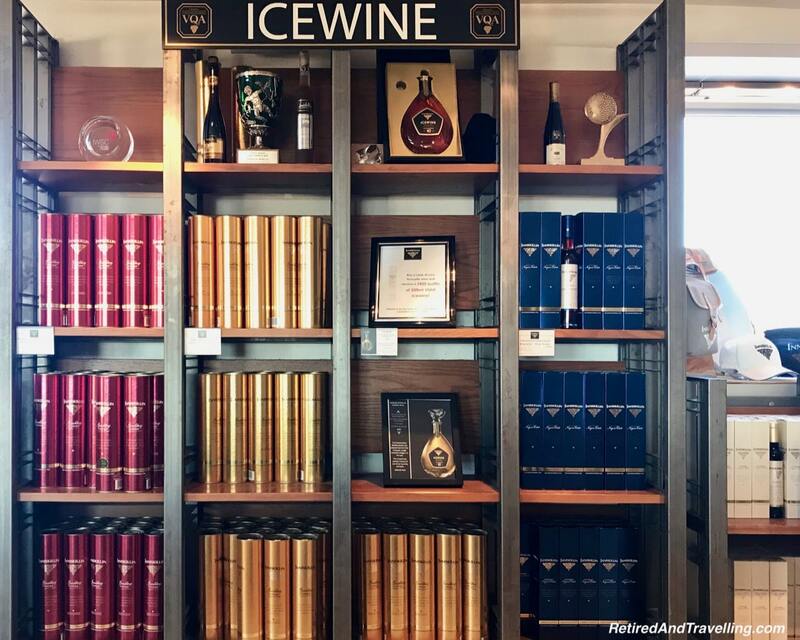 The Cabernet Franc ice wines won me over. I was happy that our icewine tasting in Niagara introduced me to some new icewine varietals to love. 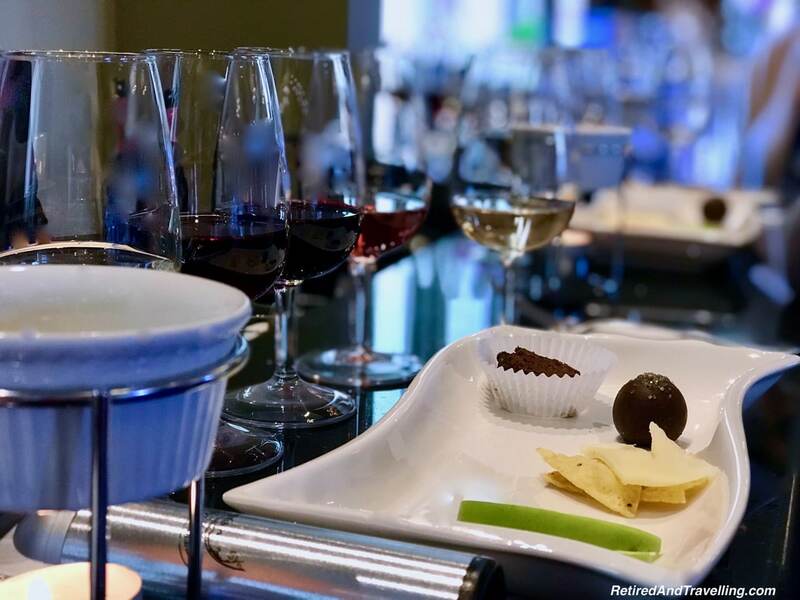 Wine pairings with cheese and chocolate reinforced our view that you really need to understand how foods can help or diminish the taste of wines. 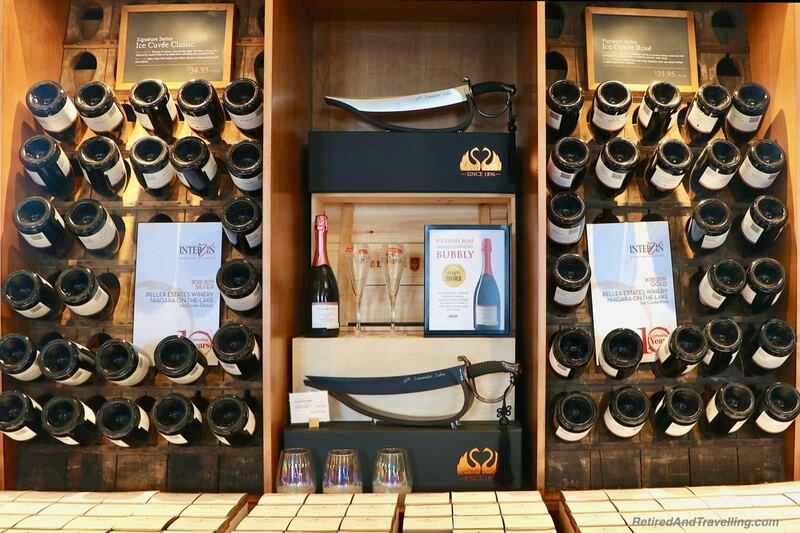 We have added many wines to our list of favourites when we did wine and food pairings on our Oceania Cruises trips. We loved the chance to try our ice wines as a slushy drink. 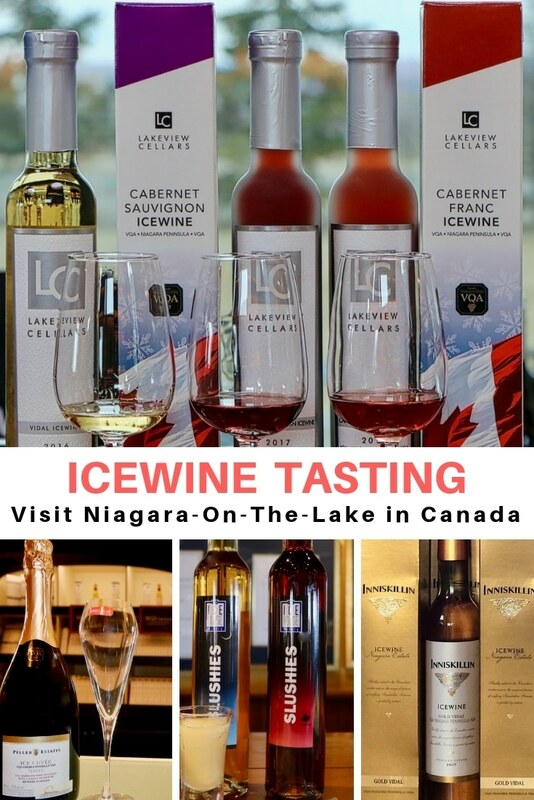 Have you done icewine tasting in Niagara? 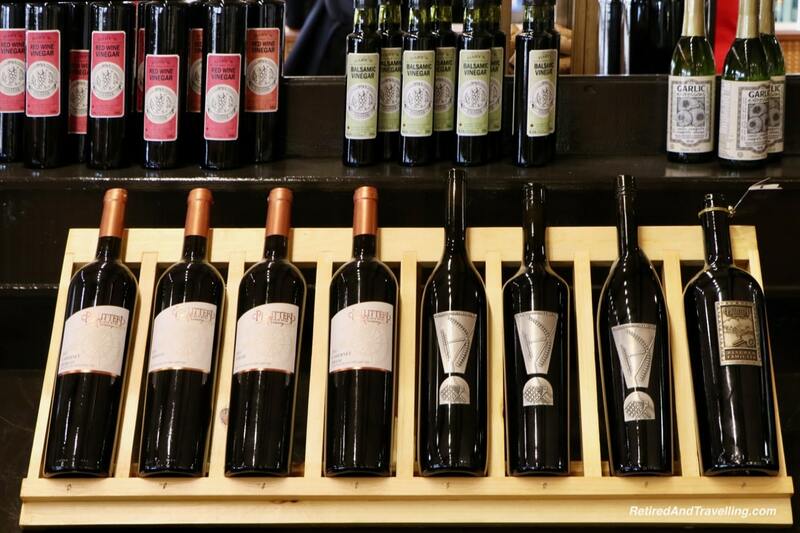 Did you love or hate these sweet wines? I learned something new about wine today and I didn’t think that was possible. Ice wine – waiting for the grapes to freeze on the vine. How cool! And what a special treat to stay at the Ritz! As someone who drinks a regular wine every other night, I am very interested to learn about icewine for the first time! Although, I am still confused though what’s the difference of the two and in what instance I would prefer this one from the regular. You had me at chocolate ice-wine truffles! Its such a pity that I didn’t pick up ice wine when I visited Niagara on the Lake a few years ago but I guess that’s probably I didn’t do my research enough to know that they have something as unique as that. 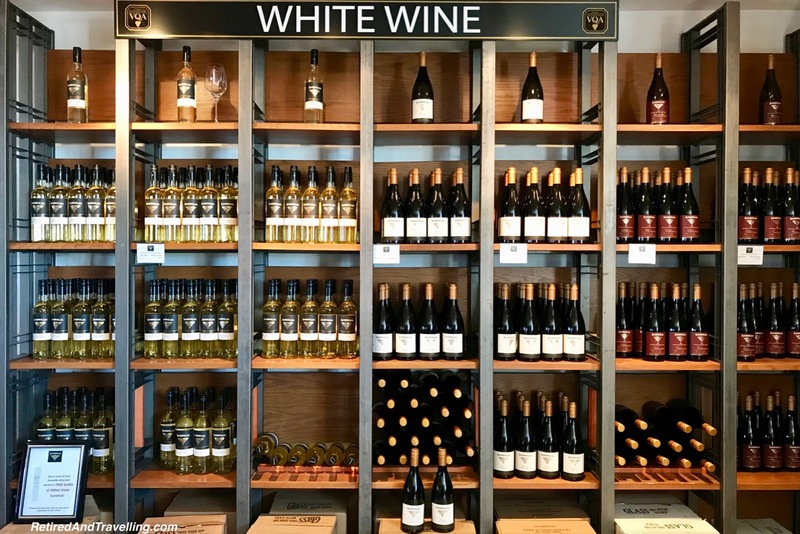 I loved reading about the process of making ice wine – the fact that the grapes freeze when the winter hits and when the temperatures hit the perfect amount, they are harvested. Very interesting read! 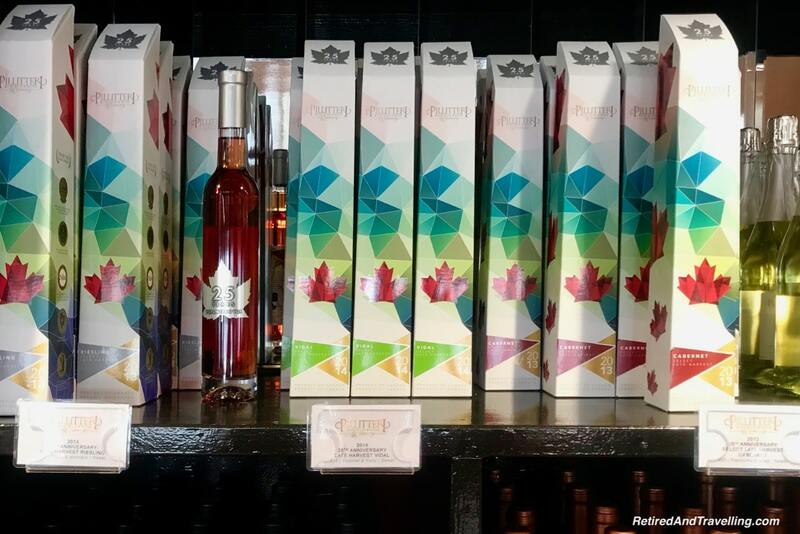 Tasting icewine at Niagara on the Lake is a fun thing to do on a short trip to the region. Staying at the Ritz looks like a treat! The only place I’ve tried icewine was in Quebec City. I had no idea they have it in Niagara region too. They told me it’s only produced in Quebec. I brought home a couple of bottles and would have liked to bring more, but it’s so darn expensive! Beautiful detour than just doing the usual day tour to the Niagara falls!! 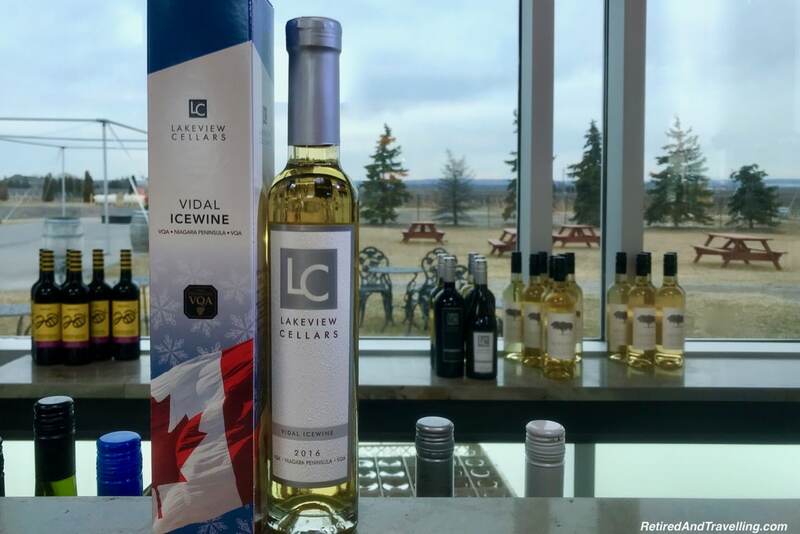 I’ve never heard about Icewine before! 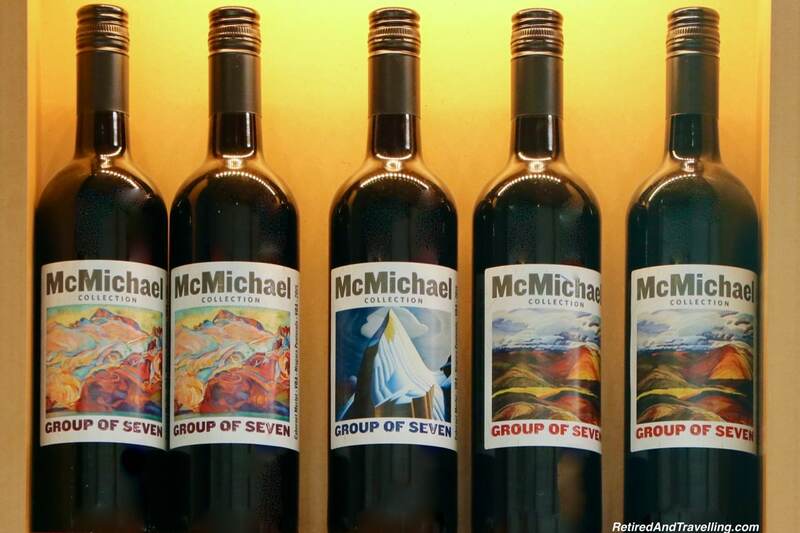 I’m not a big fan of sweet wine but I’d love to try for the experience! I’d love to do this wine route! I’ve had Ice Wines from the eastern provinces of Canada, but not NOTL. The Gewurz ice wine fascinates me – as I like a normal Gewurz. I’m with you on the Vidal wines, unlike David I can’t handle them too sweet. 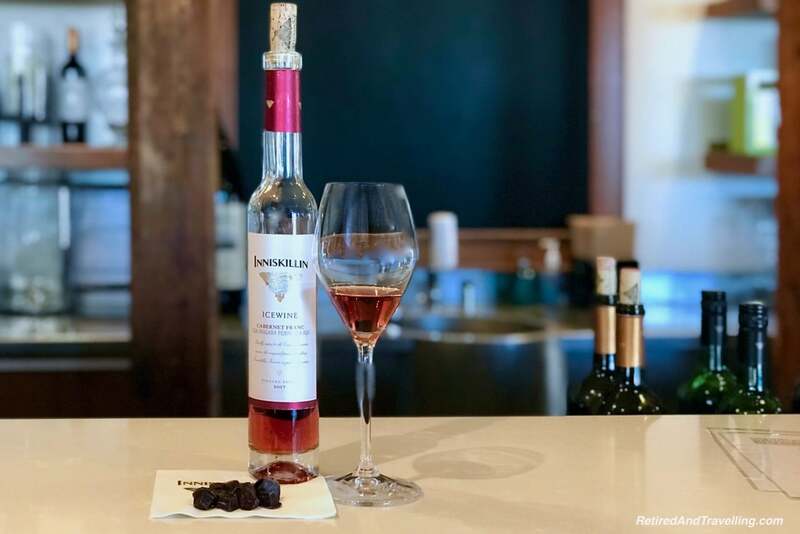 Love your comment, “the dark chocolate seemed to go with everything”…so true 🙂 As a wine lover, I’m surprised to discover Ice wines in your article. Very fascinating to learn about the grapes being pressed when they are still cold. 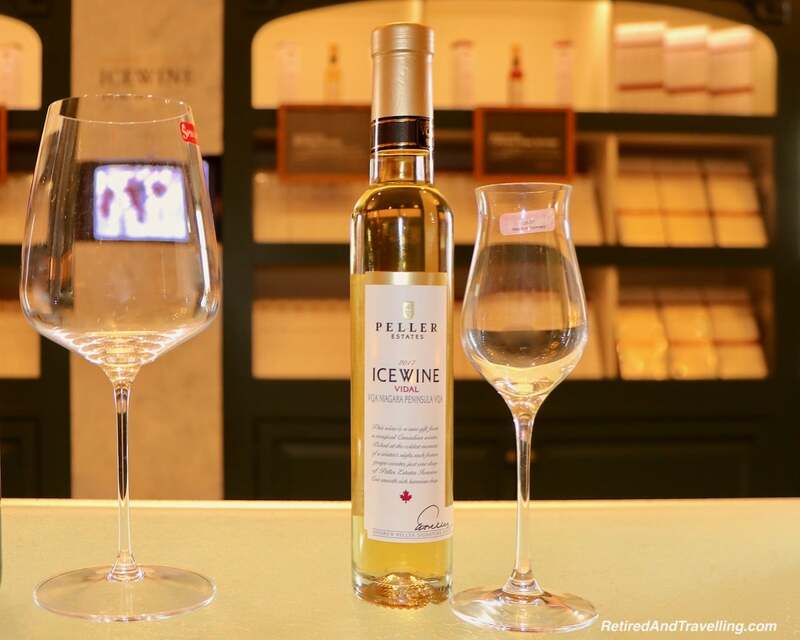 While I’m not a sweet wine fan, I’d still love to taste these Ice wines. Thanks for the introduction and virtual tour of Icewines in Niagara. The wine slushy sounds yummy on a warm day! I had never heard of ice-wine before, thanks for educating me on it. We want to revisit Niagara Falls after we get our passports. 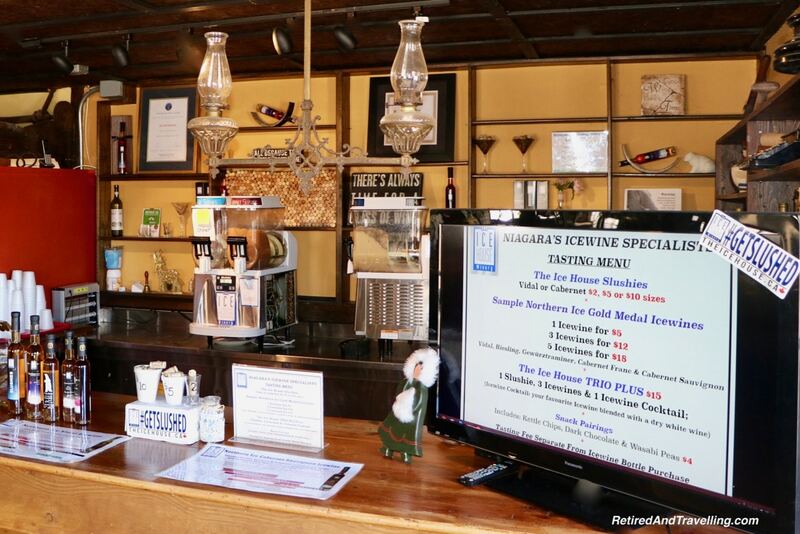 When we do, I will stop at the Ice House Winery to try some.